The Contemporary Resort is one of the most iconic Walt Disney World Resorts. It is the only resort that has a Monorail station in the lobby. It is also home to a beautiful mural done by renowned Disney artist Mary Blair ( Styled the It’s A Small World Dolls). Beyond the main building their are several more out building which house hotel guests. There is also Bay Lake Tower connected to the main building which is the DVC portion of the resort. 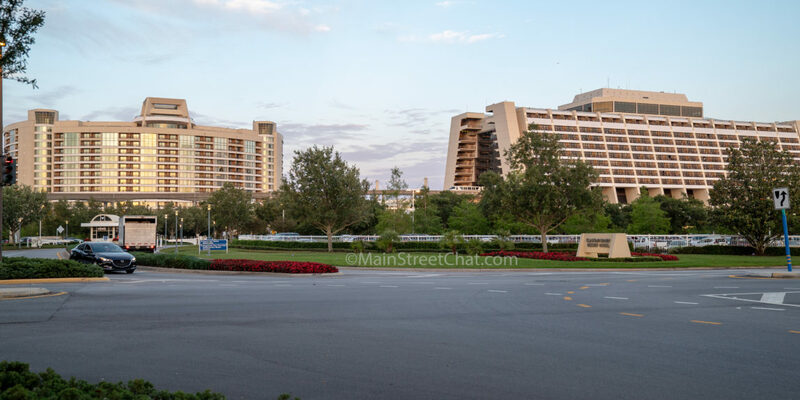 California Grill- this is the Signature dining location at the Contemporary Resort. It is popular for it’s brunch (which is supposed to be outstanding) and for dinner. It has an amazing view of the fireworks from Magic Kingdom. The Wave- Wave is open for breakfast as a buffet. It also has an a la carte menu. Lunch and Dinner are served with a traditional menu. The food style is American with an International flare. They also pride themselves on having locally sourced ingredients. Contempo Cafe– Quick service location open from 6 am to Midnight. Lots of outstanding options for breakfast, lunch, and dinner. Contemporary Grounds- Located on the ground floor near the entrance. Great place to grab a latte or a tea before walking to the Magic Kingdom in the morning. The Sand Bar- Located by the pool. Menu is very limited and includes items such as cheeseburgers and chicken quesadillas. Chef Mickeys- character dining buffet. This is a very popular spot to meet the Fab 5. (Mickey, Donald, Pluto, Goofy, Minnie). Reservations should be made 180 days in advance. Electrical Water Pageant – a nightly water pageant that takes place in the seven seas lagoon.